I am sorry for the short post, but there is no heat in my apartment, and typing with my chilled fingers has proven harder than I imagined! 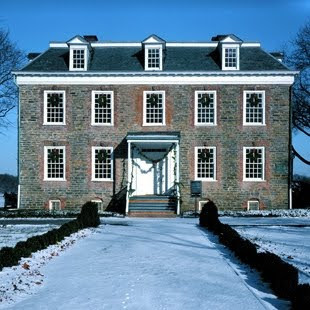 So I leave you with this beautiful picture of Van Cortlandt House Museum. Built in 1748, this Georgian House is located in Van Cortlandt Park in the Bronx, and is open to the public. Check their website for eighteenth-century holiday themed events. On a cold night like this, I would love to be inside a house as warm and inviting and this one. 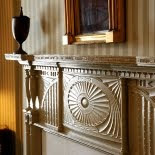 Furthermore, cozying up to a fire in a fireplace as beautiful as this one, at Gracie Mansion, sounds like the perfect cure for a winter chill. Although a townhouse on the Upper East Side is lovely, with fireplaces this beautiful and interiors by Jamie Drake, I often wonder why Bloomberg doesn’t live at Gracie! I am so sorry for you having no heat. It indeed quite cold, high winds in here in the Boston, area the snow is still coming! Great post…Especially,viewing the Governors Mansion with snow yet basking in the sunlight! Jamie Drake, is magical with designing this mansion.